The chemotherapy that I’m taking has a great reputation for doing some serious damage to cancer cells. It’s powerful stuff. The problem is it doesn’t just damage the bad cells. I liken it to a bomb going off in enemy territory. “Fantastic! We wiped out the terrorist’s compound. Unfortunately, we also took out a couple of civilians and a school.” Now, I’m being dramatic obviously but you get the point. So chemo takes out the bad cells, and the good ones, and anything that grows essentially. It really doesn’t have any respect for hair, nails, or skin. After every chemo treatment, I get a series of needles containing neupogen. This is the medicine that boosts my white blood cells so that I have some kind of an immune system. That takes care of the good cells. But what about the other stuff? Over the years, I’ve taken care of my hair, skin and nails for the most part. Probably more so because I’m in front of a camera five nights a week and I try to look my best. All of that gets wiped out over a course of weeks once you start chemotherapy. Your hair falls out, your nails stop growing and your skin dries up. I’d be lying if I said this didn’t bother me. It does. I’m not working and my social life has come to a virtual standstill since my diagnosis but I still, on occasion, want to look at my reflection and be somewhat recognizable. Remember the Billy Crystal character “Fernando” uttering the words “It is better to look good than to feel good”? There may be something to that. I exaggerate but looking good does tend to make us feel better on the whole in my opinion. 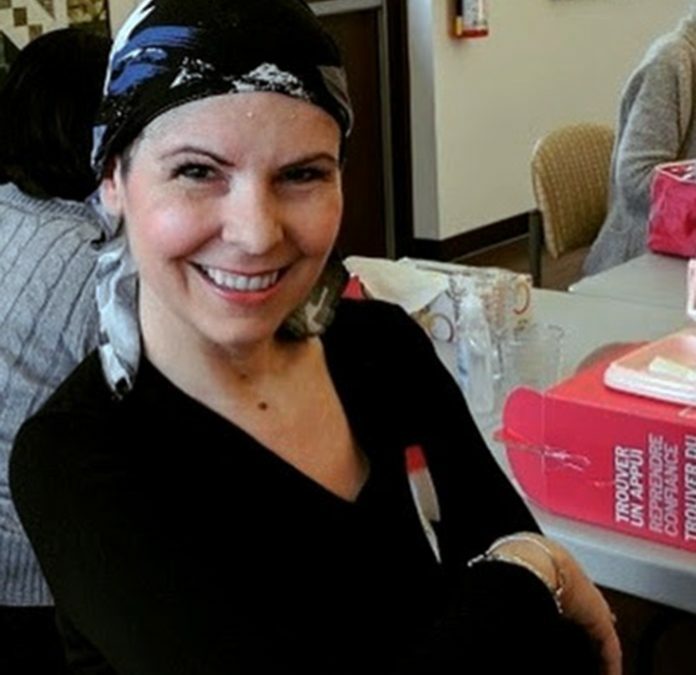 This brings me to the Look Good Feel Better program for women with cancer. I had been given a pamphlet for the program from Juravinski hospital. It sat amongst my cancer and chemotherapy booklets. I have a lot of reading material. A lot. I was advised by a friend (recently diagnosed) and by my oncology nurse to take part in it. I finally looked into the program and signed up for the next workshop. There has been a lot of advice coming my way since my diagnosis. All of it has been well meaning. I take these things in at my own pace. When I’m ready, I’m ready. Note to women recently diagnosed with breast cancer… do this workshop early on and when you feel well. That’s me doling out advice. See how quickly I’ve become one of them? Anyway, this week I attended a two hour workshop at Wellwood, a cancer support centre in Hamilton, Ontario. They do this program at 120 cancer care facilities across the country and have been doing it for the past 25 years. First off, it’s fun, which is great considering all of the “it’s not fun” things you have to do when you have cancer. My friend, Andrea, came with me to check it out. It was a small group. There were four of us who sat around a table, each with an array of cosmetics at our disposal. The whole point of the free workshop is to give us the tools and tricks to look good. I have been doing my own make-up for t.v. for years and felt that I wasn’t half bad at it. That being said, I’ve never had to draw on my eyebrows before. At this point in time, I still have eyebrows but that could change at any moment and I need to be ready. Seriously, it could be a disaster. I don’t want to walk around looking surprised or angry all the time just because I couldn’t draw. This is the kind of thing we are taught. If you thought sunscreen was important before, I realized it is 10 times more important for someone going through chemotherapy. We learned that we should toss our mascara after only a month (Hygiene) and we shouldn’t open an oven wearing an acrylic wig (melting). We were shown different ways to tie scarves for our heads, and learned how coconut or almond oil can be rubbed on our bald cranium to moisturize and provide relief from the incessant itching. I’m not kidding. It’s brutal. So hair, make-up, skin and nails were all covered in a fairly fast paced two hours. Tea, coffee, cookies and water were provided as well. I’m a fan of free treats and beverages under any circumstances. That’s just the beginning of the freebees. Every item we had in front of us was ours to keep. All brand new and never cracked open. There were top brands like Mac, Vichy, Estee Lauder, Clinique etc and it was all of ours to take home in a pretty pink cosmetic bag. I’m sure it amounted to hundreds of dollars. Included were sunscreen, moisturizer, lipstick, blush and the all important eyebrow pencil (to name a few). The women who taught us were all volunteers and the cosmetics were all donated. No brand name was promoted and all of the bags varied slightly. In a nutshell, this is the cosmetic industry giving back to the community. And it works. I witnessed a very frail, very sick looking woman come to life with mascara and a blonde wig. Her whole face lit up with the makeover. It was truly something to see. Not all days are bad when you have cancer. This was a good one. Kim MacDonald is an award winning national Canadian broadcaster at The Weather Network. She is married with two daughters. In December 2016 she was rudely interrupted by Breast Cancer. She documented her journey in a blog called “Weathering Cancer” (www,kmacblog.com) She is now in remission. Wonderful story. I myself had this wonderful oportunity to have this done in Kelowna BC. As you say, it is the one good thing we have to look forward too. I loved it all. There were many smiles….and tears as we were transformed. A huge thank you to all the sponsers on this little miracle box of prettyness. I had NO eyebrows, eye lashes, hair from the chemo either. I found the eyebrow class the best. Wigs ! Man there was alot to learn.